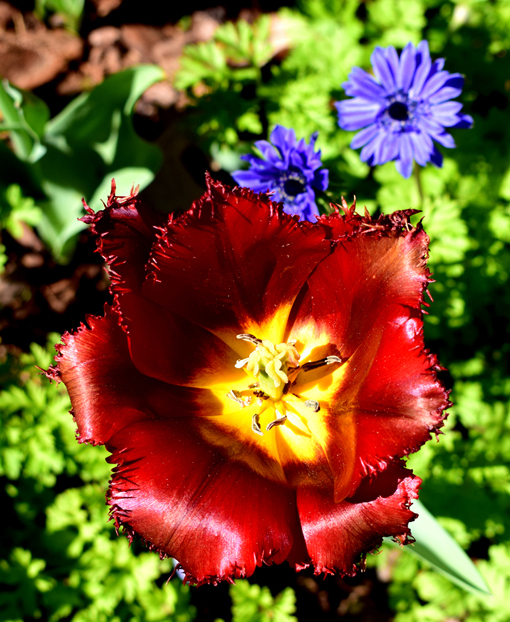 wanderlust ATLANTA: Atlanta Blooms! 2018 - 80,000 Tulips and others! I believe one of the missions of the annual Atlanta Blooms! exhibition at the Atlanta Botanical Garden was to encourage Atlantans to plant more bulbs at their homes and businesses to make Atlanta even more beautiful in spring. They've indeed succeeded in that mission! And the Garden continues to make their own exhibition grow over the years and it's ever more spectacular year after year. While Atlanta Blooms! is designed to peak over several weeks, Mother Nature has her own timeline, so I highly recommend going very, very soon. I've been a few times already and have seen totally different blossoms on those visits. 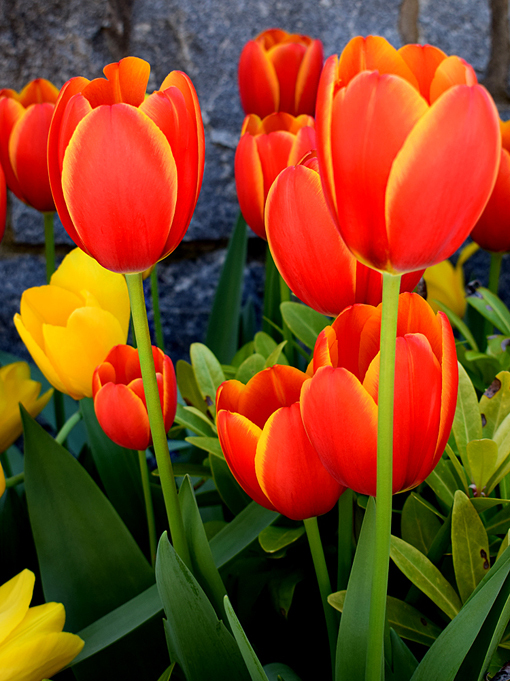 My favorite flower in the whole world is the tulip (see the story about my grandmother in previous Atlanta Blooms! 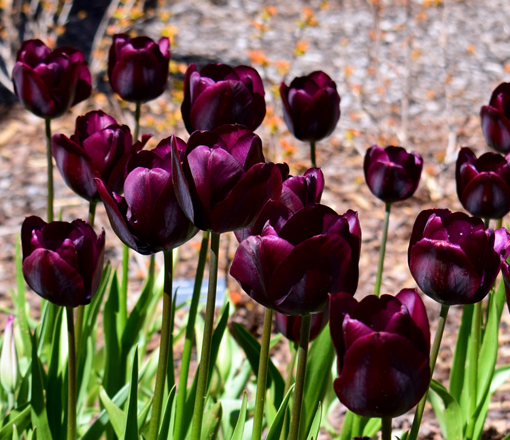 posts), so I've taken the liberty to share mostly tulip photos in this particular post. I do hope you enjoy them. 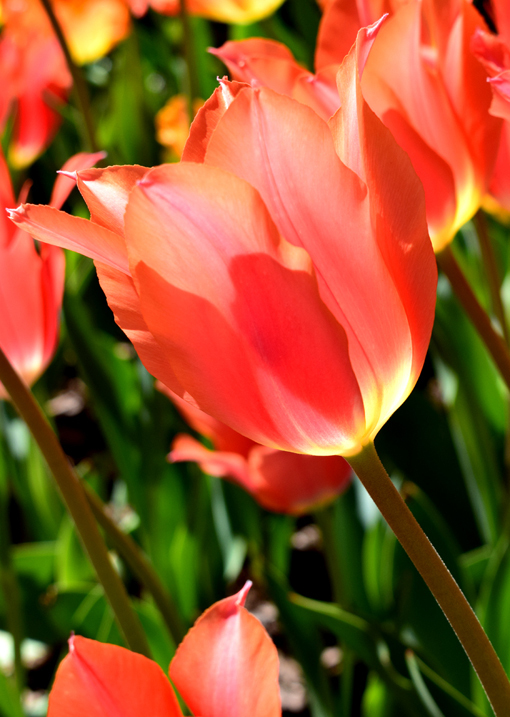 The Garden is exploding with more than 80,000 tulips, daffodils, hyacinths, crocuses and other new bulbs added to enhance their ever-growing collection! Just a reminder that there are multiple dining options while you're visiting the Atlanta Botanical Garden. There's the recently renamed restaurant Longleaf (I recommend reservations, especially for weekend brunch! ); the Quick Cafe at the back of Longleaf (sandwiches, salads, etc. ); and the Snack Bar, with al fresco seating, in the Perennial Garden near the Great Lawn. 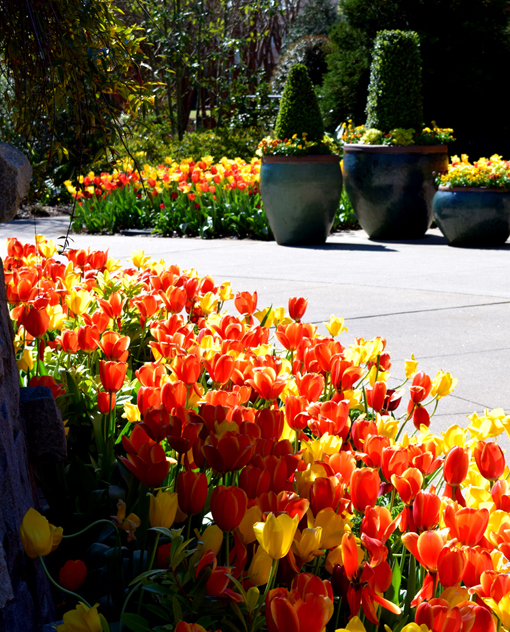 In the Levy Parterre, the Garden has blown it out by adding 5,000 more tulips than in years past. 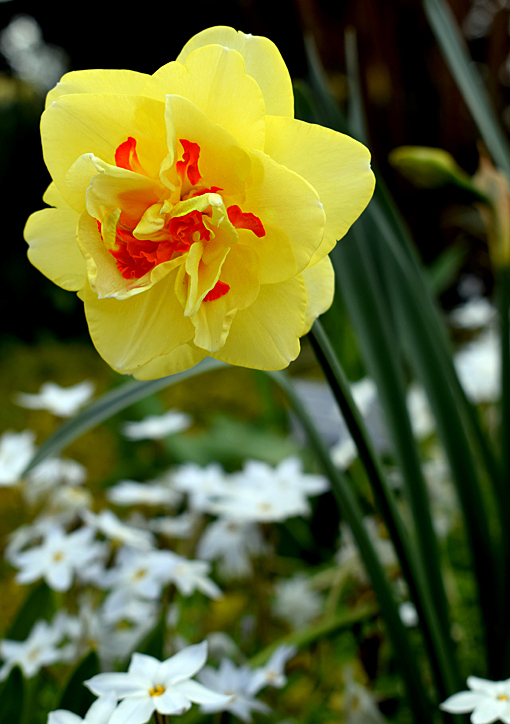 Radiant in oranges and yellows, ‘Sancerre’, ‘Orange Queen’, ‘Orange Emperor’, ‘Maureen’, ‘Big Smile’ and a host of Narcissus are sparkling beautifully! 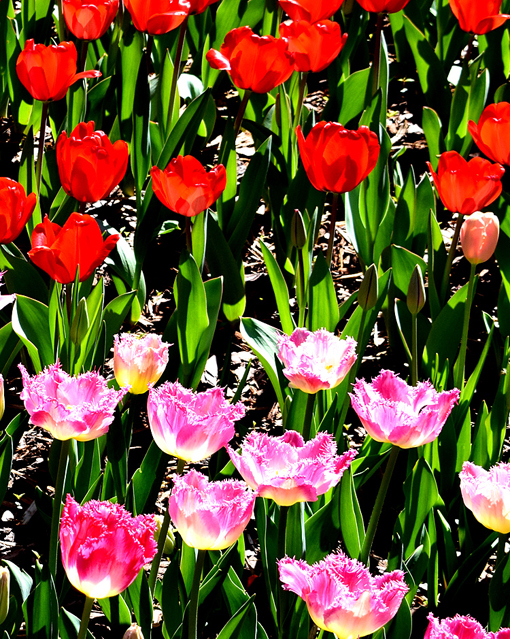 Have a little fun and discover "Which Bulb are You?" Then share with us in the Comments which one you decide is most like you! 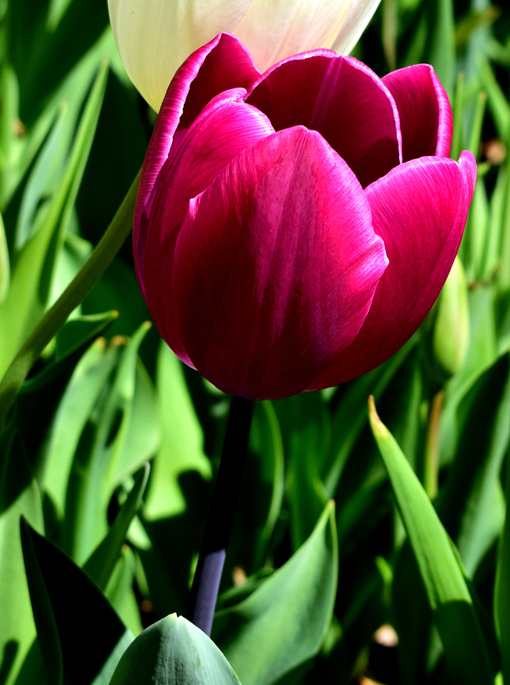 I'm sticking with the tulip, although others do have admirable qualities. Atlanta Blooms! 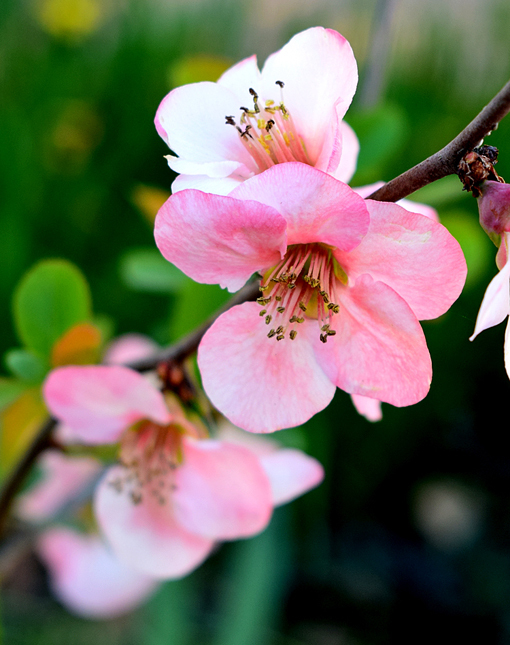 is "scheduled" (remember, Mother Nature has her own plans) March through April, but if you visit before or on April 8, you'll also get to see the annual Orchid Daze exhibition, which is absolutely stunning! The Atlanta Botanical Garden is one of the few memberships that I've maintained over the years (others I do on alternating years) in large part because of the extensive programming they offer. There's something to see and do throughout the year at the Garden. If you live in or visit Metro Atlanta regularly, I highly recommend considering a membership to our "Oasis in the City"! For the first time, the new Skyline Garden is a rainbow of spring color thanks to more than 22,000 tulips along the dramatic Flower Walk—be sure to look up and check out that amazing skyline view! Old favorites like the yellow and red ‘Hocus Pocus’ are sharing the limelight with newcomers like the crimson ’Ronaldo’. When I lived in Washington, D.C., the National Cherry Blossom Festival was "the" sign that spring had arrived. Here in Atlanta we have the Brookhaven Cherry Blossom Festival and farther south we have Macon, Georgia's International Cherry Blossom Festival, but since I moved back to Atlanta, I've always been excited when the Cherry Blossoms in front of Mershon Hall at the Atlanta Botanical Garden spring forth...for me, that's "the" sign that spring has sprung in Atlanta! Make your way to the Atlanta Botanical Garden to see this year's spectacular Atlanta Blooms! 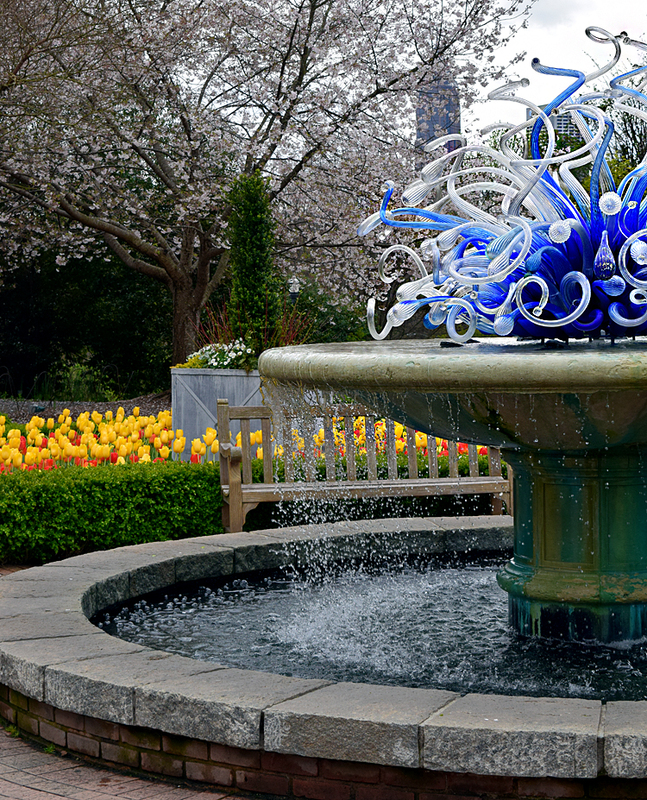 exhibition at the Atlanta Botanical Garden, and hurry...things happen quickly in Atlanta, including our colorfest of spring bulbs! Orchid Daze 2018 - A Lush Wintertime Escape!